One thing that really bothers me about depression is how it steals our joy. It does it so subtly though, that we don't even realize it is happening. This is the first real bout with depression I have had since I came home three years ago. What really showed me where my mental state was at was my inability to weep over songs like I had been. It was not uncommon, as you know if you've read this blog, for a song to bring me to tears while driving or in church. It was a common occurrence once I came face to face with the reality of the Cross. And over the last few months, I found that while I could still appreciate the words of different songs and know the truth of the Cross, I wasn't FEELING it. That's the thing with depression. It disrupts what you feel. It leaves you callous and really for me, removes most feeling, leaving me apathetic to life. Waves of sadness or despair come and go, and then once again I'm left not caring about anyone or anything. God is still God through depression. I do believe that God can heal depression without medical interference. I also believe, after being told for years that I wasn't a very good Christian if I was on medication for depression, that that is simply not true. God CAN heal depression without medication. But He doesn't always CHOOSE to. I don't love pharmaceuticals. I've actually become a firm believer in the healing power of essential oils over the last 8 months, and have steered away from most modern medicine, opting for a more natural approach to healing. However, I believe that they are out there for a reason. God gave man the ability to think and experiment and find solutions to health problems through modern medicine. It may not be the best course of action for every person, but there is value in using pharmaceuticals. And for me, that value has always been with an anti-depressant. I have seen drawbacks (like when my son was on mood stabilizers), but I have spent the last 14 or so years on and off of anti-depressants and have seen the benefits in my life firsthand. And somewhere around 8 years ago, after much prayer and trying to be off of them and just "trust God" like I had been advised, I heard God clearly say TO ME that it was okay to use what was out there to heal my mind. Hopefully as a culture and church we are finally moving past the stigma of depression and will stop telling people they don't have enough faith in God if they have to resort to pharmaceuticals to manage depression. Let me just tell you that is one of the WORST things that you can say to a depressed person who also happens to believe in God. NO ONE is in any position to tell someone else how big or small their faith in God is, except God. 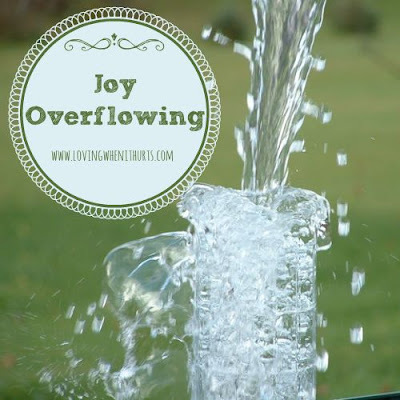 While driving to work this morning, while it did not lead to a blurry-eyed, tearful commute, I did hear a song that had me full of joy thinking about how awesome God's love is. It is a song that I have loved from the moment I heard it, that we have sung in church a couple of times, and one that really speaks to the truth that I know about God, and what my heart's desire is. Take a listen! That line in particular spoke volumes to my heart, and I felt the truth of it more than I ever have before. It is such an amazing feeling to finally be getting my "normal" back and be able to find that joy that overflows in my heart when I think about all that God is and all He has done in my heart and life these last three years. This song has been my theme song the last few weeks. I have been depressed lately and feeling completely isolated. I listen to it and imagine God hugging me. I have missed your blogs and was praying for you. It's on a completely different topic but it has prety much the sake page layout and design. Wonderful choice of colors!